DVD Drive Repair allows you to restore your DVD (Optical) Drive if missing from Windows. 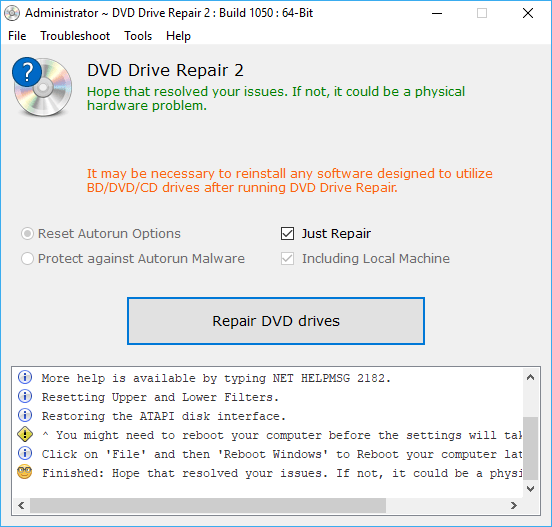 In some instances, it can also help when certain applications do not recognize your drive; mostly when your computer encountered a hardware problem or a virus attack that prevents it from using the DVD Drive. Additionally, the program can also reset the Autorun settings to default and protect your system from Autorun malware by disabling autorun features for removable drives. How to extract: Download the "Portable" ZIP package and extract to a folder of your choice. Launch DVDRepair.exe or DVDRepair_X64.exe. I updated DVD Drive Repair to 1.0.2.533. More information and download here: http://www.rizonesoft.com/downloads/dvd-drive-repair/ Could you please update the listing on TPFC to reflect all the new information. The portable download link is at the bottom of the page. Thank you for publishing DVD Drive Repair on TPFC in the first place, I truly appreciate it. Autorun.inf Editor allows you to quickly and easily create the an "autorun.inf" file that tell an autorun (also known as "autoplay") CD to automatically play upon insertion into a CD-ROM drive. You can set a label and an icon for the CD, specify a program on the CD to run when the CD is inserted, and add various entries and commands to the context menu when a user right-clicks on the CD. Downloads of "Autorun.inf Editor" are prevented due to "Server Error in '/ECommerce' Application". The author's website does NOT allow user's feedback! If you wish to continue your posting of "Autorun.inf Editor", you should inform the author's website of their "catch 22".